Massive crowds, endless music and celebrations, food, and fun; fest season in the varsity was a delightful time, with its own moments of ups and downs. “For the longest time, having lived around the North Campus since childhood, I had heard a lot about college fests. We could hear the music at our home, the roads jammed because of crowds, hundreds of students seeking shelter in the cafes of Hudson Lane. I had anticipated a great time for my own first-hand experience and truly, the hype lived up to it all!” An excited first-year student from Shri Ram College of Commerce (SRCC) exclaimed, reminiscing the good time he had at Crossroads – the annual cultural festival of SRCC. The fest season is, undoubtedly, one of the most exciting times on campus. Seeing as how it has almost come to an end by now, some of us have been left asking for more. Amidst the glamour and celebrations, there is a sense of connect that builds up between people. From charged dances to singing songs together at concerts, we all come closer. And it is these moments that some of the fondest memories of college life materialise. Truly, with the right company, enjoyment multiplies manifolds. Even as fests have become spaces for interactions and connections and celebrations, there is a lot that is awry about their organisation that needs addressing. For instance, dealing with some uncontrolled fanatics who barge into crowds; inebriated and wild. Fests have not been entirely joyous for a lot of people. There have been reports of people indulging in inappropriate behavior during fests. It is almost right to claim that fests have been given to celebrate cringe-worthy displays of power, usually by drunk men perpetrating toxic ideals of masculinity. Every college union attempts to invite the most famous artists to their fests. This year saw performers like DJ Chetas, Guru Randhawa, Jassie Gill, Vishal-Shekhar, and Jubin Nautiyal with various other bands like The Local Train and Indian Ocean. This pursuit for the most famous artist becomes an invitation to a more rowdy crowd. Although the central idea is to invite the participation of maximum people, it is undermined by how poorly the crowds are managed. For everyone who witnessed these fests for the first time, certainly the experience has been an amazing learning opportunity. Undoubtedly, it was an absolute joy listening to The Local Train’s tracks, or dancing to Vishal-Shekhar’s peppy Bollywood numbers at Crossroads and Mecca, respectively. But it was also a study in tolerance. The idea of the fests wherein all colleges and their respective societies and departments conduct so many interesting activities, allowing an exploration into a plethora of talents of students, is also commendable. In the highly commercialised food stalls and high-end designed posters and merchandise, it is good that a space for art and aesthetics is retained. Street plays, dance performances, fashion shows, singing competitions, or fine arts’ events and exhibits captured the spectators in stunning displays of aesthetics. 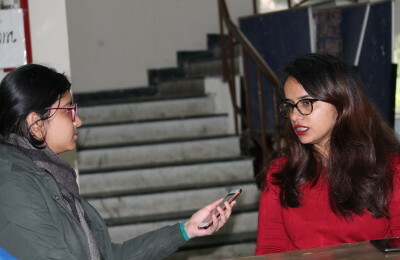 Hansraj College’s Swaranjali to Hindu College’s Alankaar, or Gargi College’s Enliven to Miranda House’s Tanz – every respective society in their respective events presented perfections. The hard-work and efforts put in by students throughout the year were made absolutely apparent, with the performances only improving successively from Reverie to Tempest to Mecca. As it was a first experience for many of us, it was also some people’s third and final time celebrating companionship and love and joy at a concert in their college. “This season has always been a blast. It is so difficult to believe that it has finally come to an end. But I feel that despite my third year, this was a first experience and it was superb. So I guess we could call this a first too!” said Bakhtawar Iqbal from Hindu College as he exited from the scintillating Vishal-Shekhar concert at his college, one last time. There is some simple yet elevated joy in this season; something that I felt so strongly, something that I cannot wait to feel again. What about you?